You can easily review past Vendor Orders with the Orders Received by Session report. 1. Select the Reports icon fro the Ascend desktop. 2. Scroll to the Inventory section. 3. Double-click the Orders Received by Session report. 4. Use the filters in the Select Filters window to narrow down your search. a. Set a date range. b. Select a vendor from the dropdown menu (or leave it set to All). 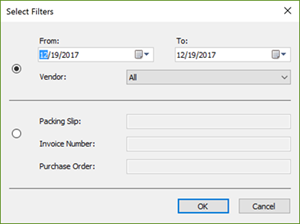 c. Otherwise, select the radio button so you can enter a Packing Slip, Invoice Number, or Purchase Order. 5. Click OK to search for vendor orders. The orders that fit your filter criteria appear in the results. You can double-click an order to open it.